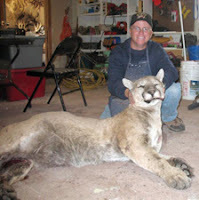 A very large puma was hit recently between Prescott and Ash Fork, Arizona by a car. Marshall and Barbara Rader said that on a dark night in early December, they were driving north on Highway 64 about halfway between Williams and Valle when a huge cougar leapt in front of their Ford F350 truck. While the Raders didn't weigh the catamount, it took three men to lift it and everyone who saw it estimated it weighed 200-220 pounds, Marshall Rader said. Its paw was about 8 inches across, and it was more than 7 feet long from head to tail. He could see its head over the hood of his truck.